Keukenhof Portiere I tapestry shows a scene from the famous expansive garden in Holland. The portiere is the long and narrow tapestry style which has been used in palace chambers and walls to decorate. Here the plentiful tulips in orange, reds, pinks with greenery and a lake in the background with trees beyond. Thousands of bulbs are sown every year, and provide a tulip garden sanctuary. 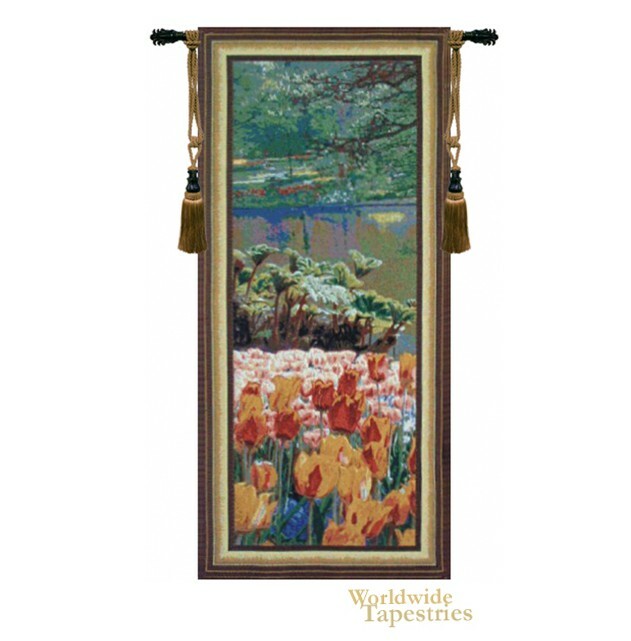 This Kuekenhof Portiere I tapestry is backed with lining and tunnel for easy hanging. Note: tapestry rod and tassels, where pictured, are purchased separately. Dimensions: W 29" x H 66"